A native of Alabama, Dr. Stamps is a graduate of Auburn University (B.S. in history) and The Southern Baptist Theological Seminary (M.Div., Ph.D. in systematic theology). He comes to AU after serving as assistant professor of Christian Studies at California Baptist University in Riverside, California. Dr. Stamps also serves as an executive director for the Center for Baptist Renewal, a fellow for the Research Institute of the Ethics and Religious Liberty Commission, and a senior fellow for the Center for Ancient Christian Studies. 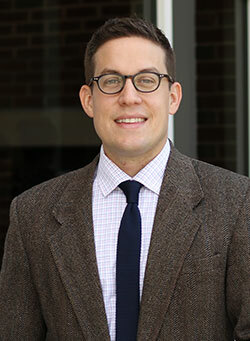 His research interests include Christology, the Trinity, hermeneutics, and historical theology. Dr. Stamps is the author of the forthcoming Thy Will Be Done: A Contemporary Defense of Two-Wills Christology (Fortress Press) and is co-editor of the forthcoming Baptists and the Christian Tradition: Towards an Evangelical Baptist Catholicity (B&H Academic). He has also published a number of journal articles and book chapters in the area of systematic theology. Dr. Stamps and his wife, Josie, have four children—Jack, Claire, Henry, and George—and are expecting a fifth in October 2017.